By Molly Skobba and Takahiro "Horitaka" Kitamura First off, I want to express how absolutely honored I am to have been tattooed by the renowned Horitomo. Not only did he take the time out of his incredibly busy schedule, but also he tattooed a one-point tattoo on my hand -something he does not do often. It was incredibly kind and generous of him and I am so very grateful. I had been super excited about this tattoo for a few weeks before the day of my appointment as I had seen the drawing and it was so beautiful, I couldn’t wait to get it. The day finally came and I had that pre-tattoo feeling in my stomach, the anticipation of the transformation of my hand and of course the question of how much pain I’d be in for crossed my mind once or twice. 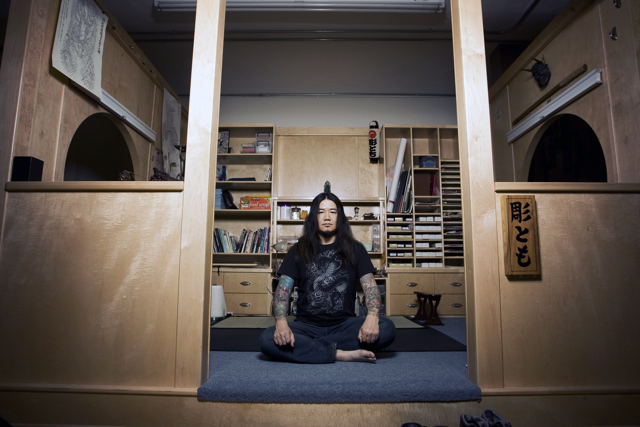 The time finally came and I entered his workstation, a custom-built teahouse-inspired tattooing area. I humbly said, "O-jyama-shimasu" the proper Japanese greeting you give when you enter someone’s place. We sat down on the floor as is the custom with traditional Japanese tattooing and he measured my hand with the stencil. It was a perfect fit. 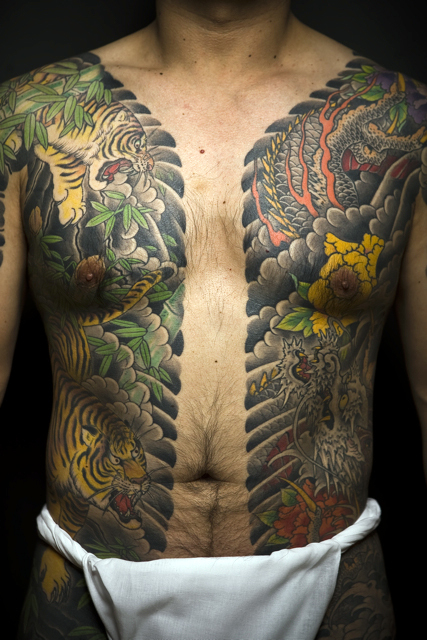 Watching Horitomo tattoo is like watching a tai chi master moving with fluid grace and thoughtful purpose. He takes his time in softly analyzing the form the tattoo is taking, going with the flow of the session. 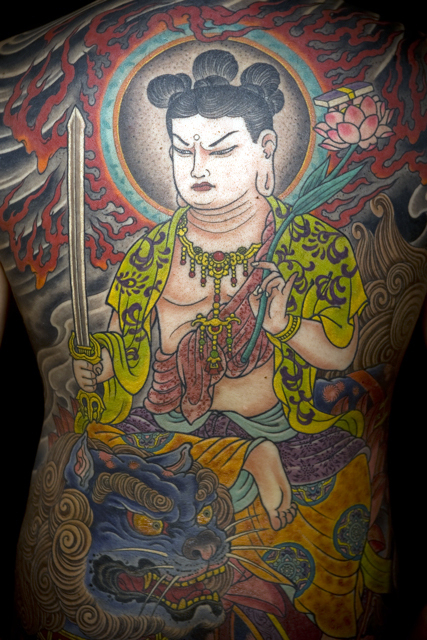 If Zen tattooing existed, that’s exactly what it would be. The tattoo took about two and half hours and well worth every minute. Rather than a perfect computer-generated 7-liner line, the technique in his brush-like lines are artistically subtle and this is where his true wizardry shines through. Another thing I love about this tattoo is the subtle coloration of muted tones, giving it a real old Japanese wood block print look. I do not simply have a new tattoo; I have a new piece of art.